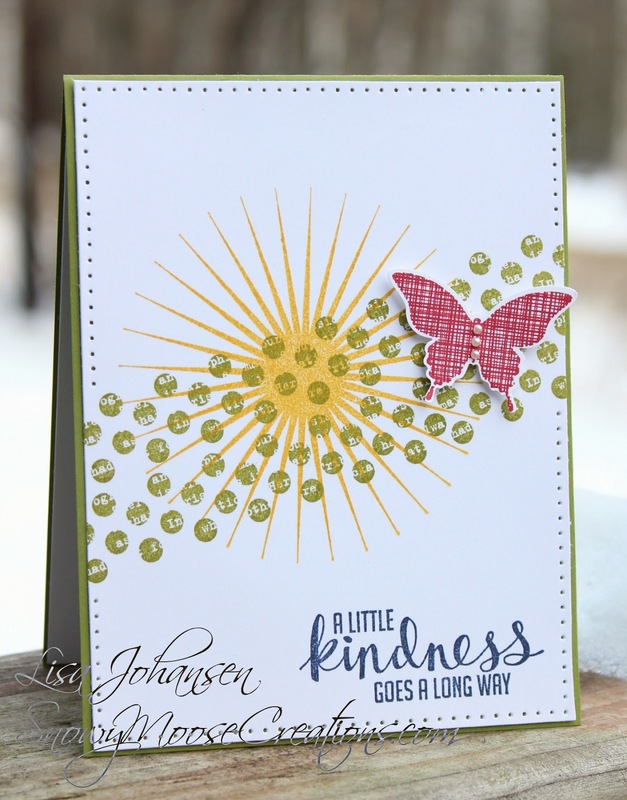 I had some free time this afternoon and so I sat down to play along with the sketch over at Stampin' Celebration. The sketch had me stumped for a bit but I decided to think outside of the box and my comfort zone a little, and that's where the SU set Kinda Eclectic came in. I don't think I've used this set since getting it last year! I stamped the diagonal portion in Old Olive,two strips one on top of the other. Then I stamped the sun in Daffodil Delight over the Old Olive portion. The butterfly was stamped in Cherry Cobbler and punched out. I added some small Basic Pearls to the butterfly for a little detail. The sentiment was stamped in Night of Navy. To finish the card off I did some paper piercing around the edges. Make sure you head over to Stampin' Celebration and play along! Thanks for inspiring me to pull out that stamp set again! Beautiful card, love the color combination! The paper piercing on the edges really does add an extra pop to the card. Thanks for including Stampin' Celebration in your creativeness! Love how you used Kinda Eclectic for this super cool take on the sketch!! This is a wonderful card - stamp set was a perfect choice for our sketch! So happy you joined us at Stampin' Celebration. The pierced edges really make this card to FANTASTIC!! Love your stamp choices and design!! Thanks for joining us at Stampin Celebration!!! Absolutely LOVE what you have done with this stamp set and challenge! LOVE IT! I'm going to pull out my Kinda Eclectic and CASE you. :) Thanks for linking up with the Stampin' Celebration Challenge. I sure can't tell that this sketch had you stumped! You totally rocked it! Your card is fabulous Lisa! Thanks for joining us at Stampin' Celebration!